Reverential homage to Poojjyapada Sri Sathya Sai Baba on his fiftieth jayanthi. He was born on November 23, 1926. It was a Monday, Somavar. The month was Kartik, specially sacred for the worship of Lord Siva. The ascending star on that day was Ardra. The combination of Karthik Somavar and Ardra Nakshatra is rare and is exceptionally auspicious. To see him is a feast for the eyes. To listen to his spell-binding oratory is an education for purposeful living. To hear his soul-stirring bhajans is to go into ecstacy. Once we meet him, he simply haunts us and we cannot but give him a permanent lodgement in our heart. Majestic and winsome, simple yet sophisticate, steeped in our ancient lore yet well-versed in current affairs, agile yet imperturbable, wise and witty, with a bewitching smile and a visage that exudes sneha and karuna, with the shock of curly hair that forms a natual crown on his head and the flame-red one-piece robe that stretches from neck to feet, Sri Sathya Sai Baba is a magnificient personality. Baba is virtually deified by lakhs of devotees the world over. In their homes and offices, his photograph finds a pride of place among the family deities. I have seen his picture adorning the tables and office-rooms of many of our distinguished leaders, editors, literateurs, scientists, administrators, senior officials in the Secretariat in New Delhi and State capitals and even in the Indian High Commision in London. One of the most arresting and revered personalities of the century, Baba spontaneously commands the respect and reverence of millions of people, in India and abroad. He has his own unique way of transforming people in all walks of life. Their number is legion. It is indeed true that Baba's devotees include a sizeable number of those who are drawn to him because of his superhuman power or siddhi and are proud of venerating one endowed with such a rare gift. And it is equally true that down the ages Mankind has always viewed the mysterious and the miraculous with awe and reverence associated with godliness. But then not all of Baba's devotees belong to the class of mysetery worshippers. His followers include many people noted for their intellectual attainments, rational outlook and scientific research. What is the secret of this magnet in human form that goes on irrestibly drawing devotees whose ranks are ever swelling? Is it his power for materializing out of thin air with a mere wave of his hand an amazing array of objects that holds the key to his irrestible pull and commands the spontaneous adoration of the multitudes? The Baba we adore is _not_ the one who performs miracles of materializing Vibhuti, photos, rings, necklaces, silver and gold idols, spatika lingas and other precious articles, but the Baba who performs the greater miracle of transforming men. The Baba we adore is _not_ the one from whom people expect cure for all their physical ailments-- after all, the human body is ephemeral and it must progressively decay and wear out and birth and death are but obverse and reverse sides of the same coin and the one is inseperable from the other. The Baba we adore is _not_ the one, who according to some, is the founder of a new sect or cult, but the Baba who stands for Sarva Dharma Samanatva. The Baba we adore is the Baba who, without fuss of the `arrogance of humility' associated with knowledge and scholarship, lovingly and convincingly dins into people the inner meaning and significance of our ageless traditions, symbolism, customs and manners. The Baba we adore is the Baba who is the bhakthavatsala, the snehamurthi, the karunasagara. The Baba we adore is the Baba who comprehends the basic motive of everyone and who ensures eternal life to ideals and institutions which seek to represent the life-breath of Sanathana Dharma. Wednesday, December 23, 1970. At Dharmakshetra, atop a hillock overlooking the Western Ghats, in the shade of the beautiful lotus-shaped Sathya Deep blooms the Bombay abode of Baba. The sun had set some time ago and there was an all-pervading quietness. The sky had been lit up by the innumerable stars and star-clusters. There was something indescribably serene about the atmosphere. The clock had just struck the quarter hour to eight- the clock, the handiwork of man, a mechanical contrivance which, in its littleness, is vainly trying to measure the Immeasurable Eternity. One felt the hovering presence of some Mighty Force. As Yudhisthira, the eldest of the Pandavas averred, the mind is famed for its swiftness even to outstrip the wind. But in Baba's presence, the mind is riveted, as it were, and stands still, as if bidden. In the verandah was an American, Dr. Joseph Hislop, from California. For the past forty years, Dr. Hislop had been on a pilgrimage in quest of Truth. He had associated himself with various religious and saintly organizations, and had been making a study and pursuing the search by a life of dedication to the cause. He has been a keen and ardent student of Eastern Religion and Mysticism, having had long contacts with Burmese monasteries (Buddhist monks) and Indian teachers of Yoga like Sri Mahesh Yogi. Dr. Hislop was reading the Guruvayurappan number of the Bhavan's Journal (December 13, 1970), standing in the verandah, slightly resting his back against the wall. Suddenly there descended complete silence. All involuntarily sprang to their feet and bowed reverentially. Dr. Hislop respectfully gave the copy of the Bhavan's Journal to Baba. Baba glanced through the Journal from cover to cover, graciously making sparkling explanatory commands and remarks. In particular, he stopped at the the feature on Upanishads by Sri Rajaji and then told Dr. Hislop the gist of the Upanishads in a few short and succint sentences. He spoke of the yound, bold, intrepid inquirer of Truth, Nachiketas, who went to the abode of Yama, the God of Death, and wanted nothing but imperishable knowledge t hat enabled man to conquer death. Yama offered him the best of things, things beyond the reach of mortals on earth, tempting and alluring. No persuasins, no entiecements could move Nachiketas to give up the goal that he had set out to achieve- the transcendent wisdom to be learn from the Only Teacher, Yamadharmaraja, who could dispel all doubts regarding the mystery of life and death. Nachiketas was not made of common clay- he was one of the few that had the courage turn his gaze inwards to become one with antar chakshus and seek the truth and not, unlike the millions of commoners, to let the senses go after external pleasures. Yama imparted to him the Truth, and the vision of the ultimate reality dawned on Nachiketas. Turning his attention again to the picture of the Lord on the cover, Baba queried: `What is the significance of the Sankha (conch), the Chakar (discus), the Gada (mace and the Padma (lotus) in His hands?" None dared or could answer the question. We all looked on in mute silence expectantly for the answer. Baba explained: "The Sankha represents the Primordial Sound, the Nada-Brahma. The Chakra," he said, "symbolizes the Kalachakra, the Eternal Wheel of Time, that rolls on and on and on. And the Gada," he proceeded, "symbolises the Will Power, the sankalpa shakti of the Lord, whose potency is voiced through the epigram- tena vina trinamapi na chalati- without His Will not a blade of grass doth stir. The Padma is the thousand-petalled flower, symbolizing the mind, with its fitfulness, rushing forth in all directions and the Lord hath it in His hand to proclaim that He is master over the minds of men." In 1971 a dear and respected elder, a distinguished educationist and philosopher, a former director of Bhavan's Delhi Kendra, and myself went on a pilgrimage to Puttaparthi. We left Bangalore by car about 3 a.m. so as to reach Puttaparthi by 6 a.m.
During the three hour 100-mile drive, we discussed, among other things, about the advisability or otherwise of accepting a donation offered by a philanthropist for conducting research in Bhavan on Vishtaadvaita. The Bhavan has always firmly stood against fanning differeneces- denominationsl, religiousll, regional or linguistic. It is is pledged to foster harmony, unity. In view of the unbridled fanatic zeal of some of the overzealous followers of the great messiahs, there was a natural anxiety on our part as to whether the accpetance of the donation was likely to unconsciously carry with it the seed of some futile controversy on some abstract aspects of something or other. However, long before we reached Prashanthi Nilayam at Puttaparthi, we unanimously came to the conclusion to recommend acceptance of the offer to Bhavan's Executive Committee. Thereafter, we discussed many other matters and by the time we reached Puttaparthi, we had forgotten all about the donation offer. We reached Puttaparthi at about 6 A.M. As usual, there were large crowds of devotees, from far and near. When our request to have an audience was submitted to Baba, he told the messenger that "they left Bangalore at 3 A.M. They have not even taken water this morning. First give them breafast and then let them see me." When we were duly ushered into Baba's holy presence, we prostrated before him. He affectionately patted us and bade us to sit. After solicitous enquiries about the Bhava, with a broad grin, he said, "Some people think that Advaitans and Visishtaadvaitins- followers of Adi Shankara and followers of Ramanuja- cannot work together, isn't it? This is absolutely wrong." We were dazed. How could he have known what we had discussed a few hours ago in the privacy of a speeding car? Baba added. "The Saivites hail their Ishta Devata as Pasupati, while the Vasishtaadvaitins hail their Ishta Devata as Gopala. Is there any differnce in substance?" Then with his characteristic smile, Baba asked, "What is the name of your friend?" I replied, "Professor Sankaranarayanan". "Does not his very name proclaim that Sankara and Narayana are one? How can there be any difference between Advaita and Vishishtaadvaita, Saivites and Vaishnavites?" On December 30, 1971, Munshiji's 84th Birthday, I had the privilege of escorting Baba from Dharmakshetra at Andheri to the Bhavan at Chowpatty. During the 45 minute drive in his inimitable style, Baba explained some of the truths of life. Referring to Kulapatiji, Baba remarked: "The machine is good. It has worked well. But it has gone old and worn out. It may break down in less than 4 to 6 weeks." When Baba met Munshiji in his sickbed, the latter never asked any question about his own longevity of family matters. His sole concern was the Bhavan and its future. Baba emphatically said: "Your sankalpa in establishing that Bhavan was absolutely pure and unselfish. In the same spirit, you have nursed it with love and care. You have rightly declared that it is God's work. you may rest assured that the Bhavan will flourish and render more and more useful services to the cause of culture in India and outside." Munshiji literally shed tears of joy. And Munshiji breathed his last on Monday, February 8, 1971, in less than six weeks! It is not uncommon, particularly in our country, that many institutions flounder when the founding father fades away from the scene. But fortunately for the Bhavan, thanks to the blessings of the godly and good, and the dedication, foresight and genius of Munshiji, the Bhavan is forging ahead. The Seed of the London Kendra of the Bhavan was sown in June, 1972- about a year and a half after the passing away of Munshiji. The decision to found a Kendra in London was an agonizing one. "Will it be a leap in the dark? ", "Will the Kendra thrive? ", "From where will the resources come?" -- all these and a hundred other questions had to be sorted out before embarking on the venture. On the day prior to our leaving for London for exploring the possibility of opening a Kendra there, I had Baba's darshan at the Sardar Patel Stadium at Worli, Bombay, where he addressed a vast concourse of lahks of devotees. Among the milling crowd, I was just a speck and, even if I wanted to, I could not have thrust myself forward! Baba who was taking a round among the crowd suddenly stopped in front of me and surprised me with these words: "You are going to London tomorrow? "I said, '"Yes." "Well, go ahead with faith. Whatever may be the initial difficulties, the Bhavan's London Kendra will flourish." And true to his prophetic words, the Kendra has got over its teething troubles and is now doing well. A Merchant-Prince from Gujarat who had made his fortune by his untiring industry in East Africa once came and met me in the Bhavan a few years ago. The man who exuded opulence from almost every pore of his body, I expected, would also be brimming with inner joy, but, alas, this was not to be. He did laugh during our conversaion, but the laughter sounded hollow and in fact it was only an echo of his deep grief within. I enquired of him whether there was anything worrying him secretly. He opened up and said, "Yes, it is my young son, eldest son..." He could not talk easily, such was his anguish. Slowly I gathered that he was sorely distressed because his son who was in England for higher studies had been nearly `seduced' into leaving Hinduism and embracing Christianity. All the persuasive efforts of the father and the even more worried mother had fallen flat on the youngster for whom Hinduism, with its "maze of thousands of gods and goddesses" held very little attraction and appeared irrational and anachronistic. The gentleman sought my help in infusing his son with faith in Hinduism. I explained to him that our ancients had enjoined to look upon one's children as equals after they attain the age of 16. Hence, any compulsion was likely to harden the heart of they impetuous and misguided youngster in pursuing his own decision. I also stressed the futility of brow-beating of imposing a decision on a confused and bewildered, though sincere, soul. I told him tht the best way to `teach' was to follow the way of Lord Krishna in the Bhagavad Gita: expound and explain the pros and cons of the issue and then tell the son, as the Lord told Arjuna: "I have explained everything to you. Now you do what you think best." However, I suggested to the anxious father that his son might get a much better insight into Hinduism by coming into direct contact with noted religious leaders. Entirely agreeing with this view, the father pleaded that his son should be exposed to the influences of some of the religious luminaries in our land. Indeed, two well-known Swamijis had a dialogue with the young man but then, he could not be deflected. In the meantime, I had aslso given him a few of the Bhavan's publications for reading and understanding Hinduism in depth. As luck would have it, Baba happened to be in Bombay at that time and on Christmas day he was to speak on Jesus Christ, the Prince of Peace, at Dharmakshetra. I suggested to the worried father that he should try and take his son to the Baba's meeting which might change his mind. At first, the young man did not seem particularly enthusiastice, but somehow he was persuaded to attend. The boy, his parents and muyself motored together to Dharmakshetra. 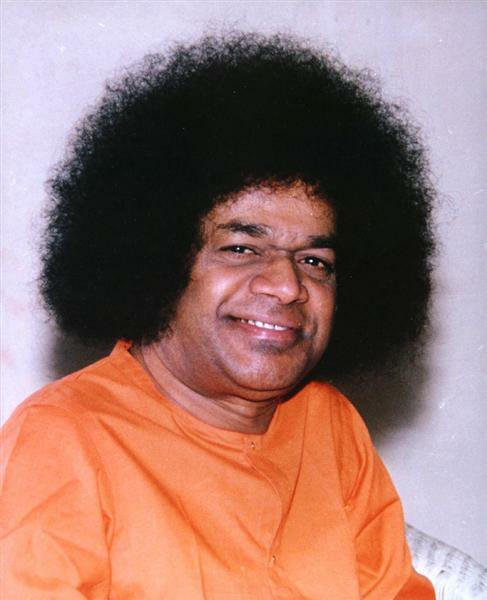 From Sathya Deep, Baba came down to the pandal, moved among the vast concourse and then commenced his holy sermon on Christ and the significance of Christmas. When the speech was over, wild with enthusiasm the young man embraced me and said, "When I saw him and his childlike simplicity and overflowing love and total freedom from fanaticism, my heart throbbed. When I was listening to his message, my mind stood still. My doubts vanished. I now realize that Hinduism is all-inclusive, all-embracing, is the `Mother of all religions.' I am convinced that the core and kernel of all religions are the same. To be a genuine Hindu is to be a genuine Christian or Muslim or Parsi and vice versa. Mere changing of label by formal conversion is unnecessary, nay, it is indeed irreligious." "We should not give attention and thought to the Vibhuti that comes out of the photographs. We must make an attempt to see that the Vibhuti of divinity comes out of our own heart. The meaning of the word Bhagavat Vibhuti is that you should develop what is called divine sight or divine vision. You should utter divine words. In your own life, you should propagate and give rise to divine ideas. The kind of Vibhuti which you see on the photographs may come today, but may disappear tomorrow. It may be created by some people in order to give favour for some kind of thought. We should not attach any importance to this transient phenomenon. It is a matter of some regret for me that members of the Sai Organization are also giving importance to such things. This is not the correct path. Iswara who lives in your heart is something which is permanent. What comes as divine Vibhuti from your heart is much more important than the artificial Vibhuti which we see... What is contained as Ishwara Bhava in your own divinity, each one has to try and propagate and hand over to others. That is real bhakti." I have often wondered: What is Greatness, Divinity? Man in his ignorance or arrogance has endeavoured to define Greatness by many a yard--stick, but has failed in the attempt. But when we are in the presence of Baba, we _sense__ sublime Greatness-- it is in the air, suffused throuhgout in the atmosphere around. All doubts and discords, all the petty things that trouble us at other hours, just evaporate. It is dazzlingly bright, yet soothingly cool. It is felt, but is indefinable. It is everywhere, but cannot be seen anywhere by the naked eye. Sri Sathya Sai Baba is a soumyamurti. The mere sight of this Sanathana Sarathi's radiant face, full of mercy and compassion, comforts and consoles. The words that flow from him dispel all doubts. They carry with them a force that is neither that of vehemence nor of cold logic. It is a force generated by the alchem of love, springing from an Akshayapatra of Karuna and Prema.